Ohio state Rep. Ryan Smith, R-Bidwell, speaks with America in Bloom judge Bruce Riggs about the Gallipolis community. Participants attending the America in Bloom judge reception at the French Art Colony were treated to a variety of finger foods and drinks. 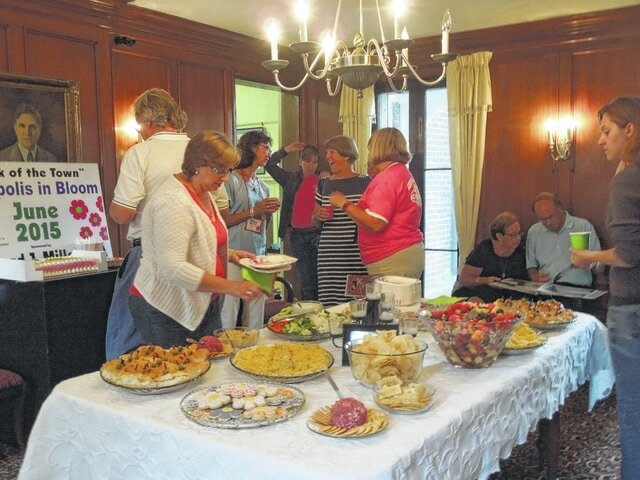 GALLIPOLIS — America in Bloom judges joined community members Monday evening for a reception, fellowship and food in the French Art Colony. There, they spoke about the days activities and shared in the spirit of community efforts to beautify the city. Leslie Pittenger, of Belpre, Ohio, and Bruce Riggs, of New Rochelle, N.Y., were picked up by Gallipolis in Bloom representatives Monday morning from their hotel before embarking on a variety of tours with community members to investigate the quality of the city’s beautification projects. After surveying various city monuments, Gallipolis City Park, tours and a view of the town from Mound Hill, hosts treated judges to a catered dinner at Bossard Memorial Library. Afterwards, city hosts took the judges on a tour of the library, the Colony Theatre, the Gallia County Historical and Genealogical Society and the Ariel Theatre before attending the French Art Colony reception. Food and drinks were provided. Various city officials made appearances, including city commissioners Matt Johnson, Tony Gallagher and Michael Brown. Ohio state Rep. Ryan Smith, R-Bidwell, also attended. “The city is really happy the judges are here. We’ve won multiple awards in the past because of Gallipolis in Bloom’s efforts and they have made us proud,” Gallagher said. America in Bloom is a national organization that promotes beautification projects across the U.S.
“I have been to visit with Gallipolis in Bloom before. In fact, when my town (Belpre) was getting started with (the America in Bloom national awards program), Gallipolis mentored us as we got started,” Pittenger said. Gallipolis is noted to have taken part in America in Bloom for at least 10 years. Gallipolis has taken awards in volunteer recognition, as well as been rated high in bloom ratings, a measurement in the overall city’s contribution efforts. A bloom rating of 5 is nearly perfect. The city has earned a four in the past. The city has also won awards in its population category. Because of this, Gallipolis has been placed within the “Circle of Champions” for having won at least three major awards in the past for its category marked by a population of under 5,000 residents. Pittenger noted that she particularly liked the swings situated along First Avenue in front of City Park. Matt Johnson noted that “winning gets you a lot more recruits” as he spoke of volunteers and the fact that success breeds more success. He anticipates Gallipolis to do well in its coming judging. Carol O’Rourke, a former city commission member, spoke with some concern with a recent clearing of trees in the downtown area. “I would be surprised how America in Bloom scored Gallipolis’ appearance, taking into account the removal of the downtown trees,” she said. Despite some misgivings, the crowd at the French Art Colony was in high spirits.